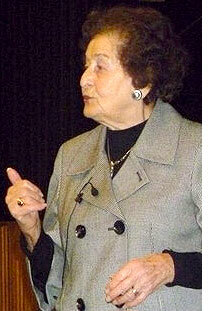 Judy Altmann was born in Jasina Czechoslovakia, which was invaded by the Nazis in 1939. In 1944 she was arrested and transported to Auschwitz concentration camp with her niece where they were selected for work. From there she was sent to Essen and Gelsenkirchen Labour camps where she remained until March 1945. She survived the "death march" that ended in the Bergen Belsen concentration camp. Sick with typhus, Judy was barely alive when she was liberated by the British Army in 1945. Ms. Altmann was given the opportunity to go to Sweden. She lived in Sweden until 1948 at which time she immigrated to the United States. Judy, who has extensive experience speaking in schools, is a member of the Holocaust & Human Rights Education Speakers Bureau and is Vice President of the Holocaust Child Survivors of Connecticut.